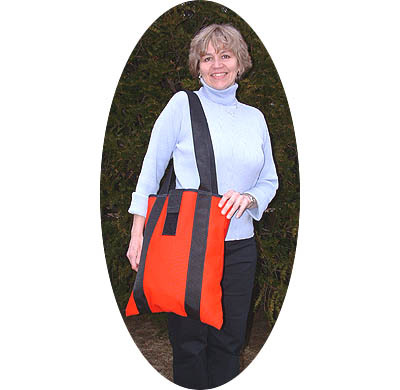 This style HD-CP bag/pouch is not your “give away” promotional bag or casual canvas tote. The bag is rugged and built for everyday day use in the real world. It is made from #8 duck and has heavy two inch webbing sewn completely around. 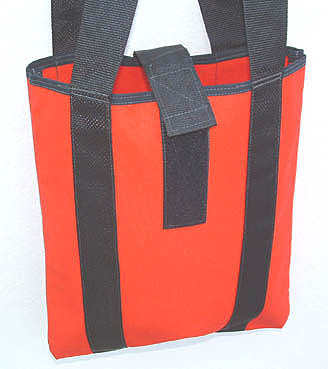 The stock bag measures approximately 15 ½ wide by 18 inches high. This bag is cut from one piece of fabric and has no sewn bottom seam. The inside edges of the bag are sewn with a single needle lockstitch machine and then the very outside edges are sewn with an overlock machine. The carrying loops extend 18 inches off the top edge of the bag allowing you to carry it over your shoulder or big enough to put over your head and across your shoulder for comfort and security. It also has a 2-inch strap with velcro sewn on that comes from back edge of bag and connects in front. This is an open style bag but the velcro strap has enough adjustment to pull the top edges together or open wider if needed. It comes in any of our stock fabric and trim color combinations giving you a wide array of choices in color assortment. 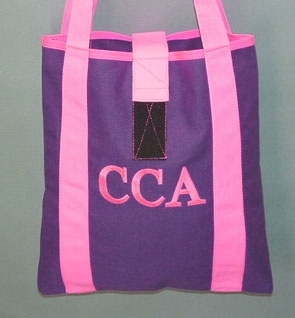 We can embroider/monogram or silk-screen anything that you may need on one or both sides of the bag if necessary. As with all our products we can change any of the measurements to accommodate your intended task. This may be something as simple as changing the finish strap/handle height to making the bag wider.